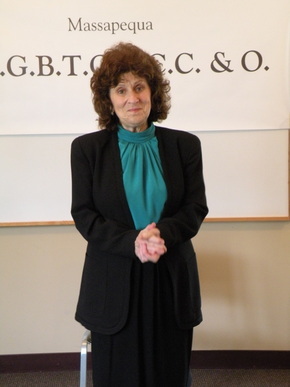 In Pride and Joy, Helene Nadler, a Jewish mother addresses the Massapequa chapter of “Parents of Lesbians, Gays, Bisexuals, the Transgendered, the Questioning, the Curious, the Creatively Concerned and Others,” about her three adult children: one lesbian, one transgender, and one gay leather fetishist. Ben Brantley, in the New York Times wrote: “Building on time-honored traditions within gay and Jewish humor, Mr. Rudnick turns stereotypes into bullet-deflecting armor and jokes into an inexhaustible supply of ammunition.” Helene is “overwhelmed and overwhelming, funny and sad, with the full courage of her contradictions [and] ultimately compassionate and understanding of her children.” Often hilarious, this short mostly one-woman play is both entertaining and a joyous launching pad for discussions of diversity in gender identity and sexual orientation. I have performed this play as the opening plenary at the Annual Meeting of the American Family Therapy Academy, at the San Francisco Theater Festival, and at the Maui Fringe Festival. Contact me for details of bringing this play to your organization, festival, university, or house of worship. Arlene Istar Lev, MSW, social worker, family therapist and queer activist. Variant People and their Families and The Complete Lesbian and Gay Parenting Guide. "Watching Anne’s performance I felt her heart in a very sincere way, as she related to the issues, the people, and social justice. I felt like she was talking to me, about me, from a place that is about us." "Watch her face and the carriage of her heart throughout. The delivery will claim your most riveted interest and stretch your most compassionate self. Anne is genius in this piece. You will not forget the message or this most gifted messenger." Betty Pristera, LCSW, Marriage and Family Therapist. MaryAnna Ham, Ed.D.. Professor Emerita, University of Massachusetts, Boston.